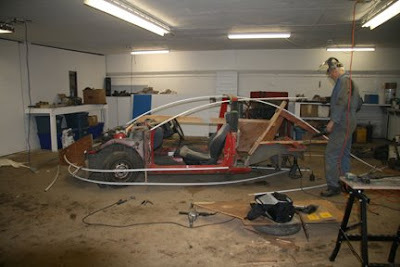 Two years ago, chassis was underway in production. It would take another two years and then some to complete the whole car but now we can see the goal!!!!!!!!!!!!!!!!!!!!!!!!!!!!!!!! Thanks to 100 sponsor donors, special people. 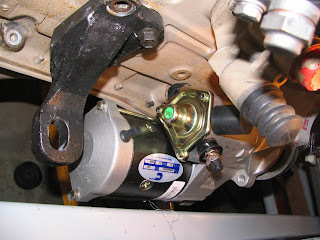 99 TRUCK Parts In Surrey came up with a belt tension er that may just work. Thanks guys!! Much appreciate your time and effort. N W Fuel knowledge and service with good prices! 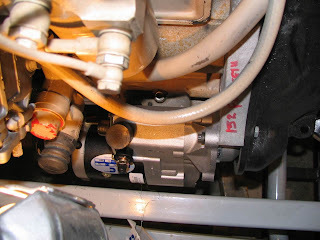 The parts shown are the positive shut off for the diesel engine and the bracket required also the fuel pump (throttle) level. Note it is spring loaded to keep a panic drive (me) from over extending the travel and ruining the very special/expensive/racing pump donated by NW Fuel Injection. Gordon Reid, happy sponsor and we are very appreciative of all the input, knowledge, parts and shop time to make us a thousand horsepower pump motor! 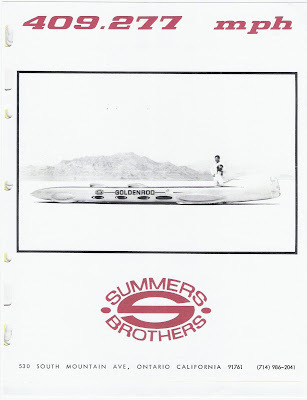 It is always a pleasure to hear from Bill Summers, of the Summers Bros. GOLDENROD ! But it will be special when I can sit,and chat about the "Polywog". Is very near to our design. 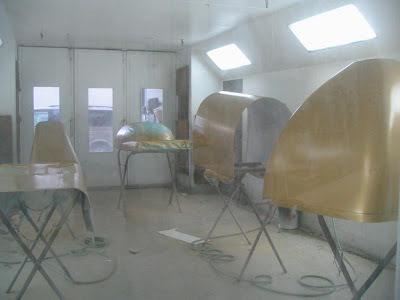 Actually the first drafts of the Goldenhawk had the rear wheels in tandem. 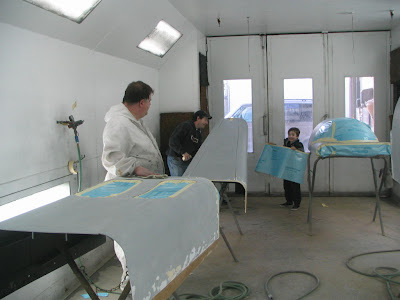 Saturday afernoon live from Paint shop. As I was watching Scotty and Barklee race each other and play during a doggy walk I remembered why it is that boys and dogs are so compatible. It is their mutual love of playing games. A love of the game! Paint'm up and move'm out! 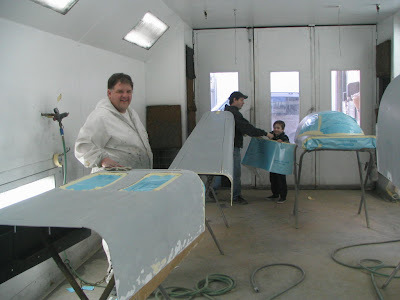 Able Autobody is a very busy place so as soon as the paint is dry we move them to the storage shed. 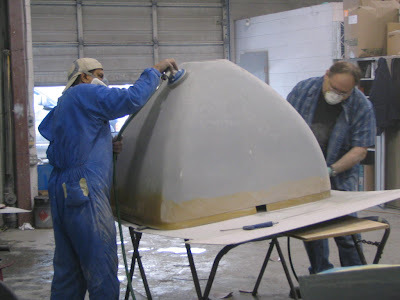 Here you can see the finished tail section. Kevin checks the first batch. 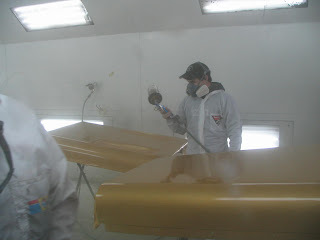 As the second batch of panels cures in the booth Kevin inspects the first ones out. Good help in the booth! Dave Andrew's nephew, Scotty came to hang out with the big kids. 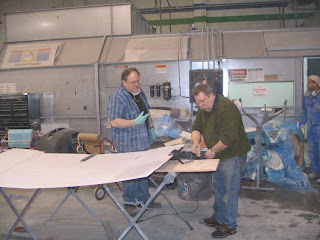 He was right in his glory assisting with the paper masking with Uncle Dave and Darryl. He is quite a bright young guy and very well spoken for his age. He told his mom he was going to be famous now! Frank Vaski massages the nose. 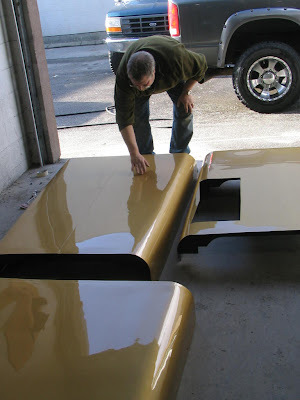 If you look back to July when we first started the body work you will see that Frank was working on the nose of the Hawk for every photo. 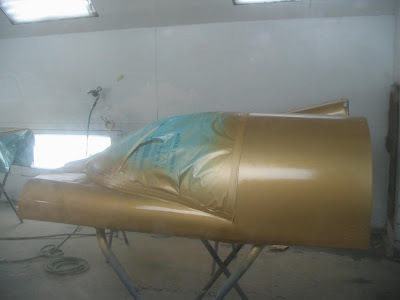 On this day he worked intently on perfecting the nose by making it very smooth so the aerodynamic are perfect! 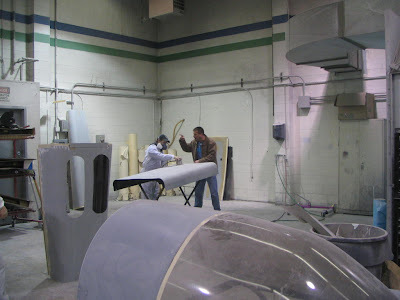 here he is being helped by Moe just before they moved it in to the paint booth. 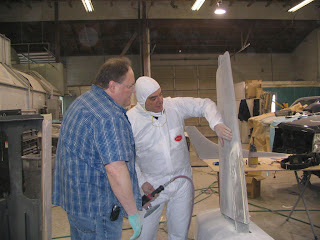 BASF Waterborne paints are "GREEN"
Darryl Tippe, was spraying paint along with Dave Andrew, in Able Autobody's booth. 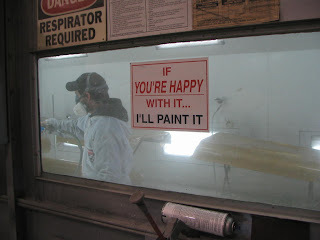 Dave is the master painter and you have to like his sign! BASF is green but it looks very gold. Kevin Knox always know what to do! When Frank asked what does Kevin use to repair ABS? I called and Kevin dropped what he was doing and came out and did the repair! That is above and beyond what volunteers usually do! These are a great bunch of guys and all good body men. 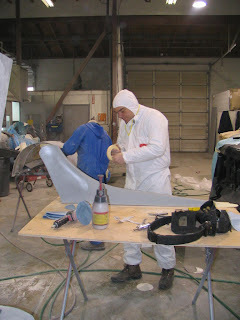 For those of you that regularly check the project, yes that is Kevin and he was repairing body pieces. He is a master of Plastics! I am doing the only thing the guys will trust me to do, "GET COFFEE", make a list of the double doubles and the triples etc and bring donuts! 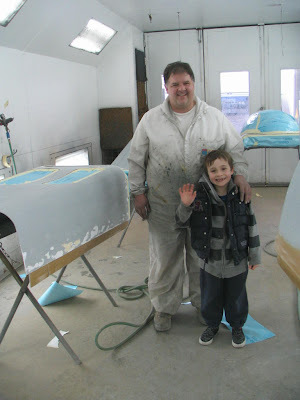 Attila spent the whole day putting the tail in order and correcting some damage that had happen in storage. 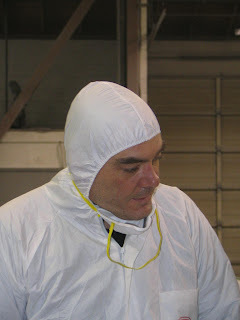 he is very quiet and intense kind of worker staying focused all the time on the task at hand. Perhaps this comes from doing special effects for the movies. 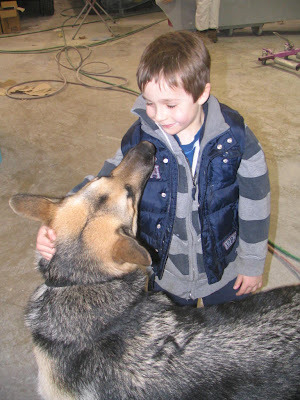 Meet Attila Vaski Franks "little" brother! Frank Vaski introduces his brother Attila to Brian Beesley , Team photographer. 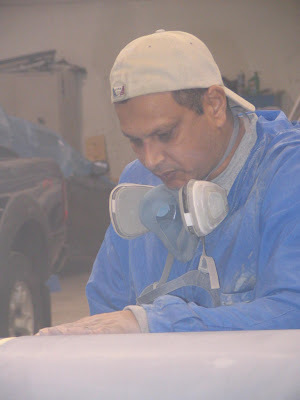 Attila is in the movie business and has come to volunteer his services that he attained from 10 years in the autobody trade. Executives get down and dirty! MOE WORKS FOR WHITE AND PETERS AND TRAVELS TO THE CLIENTS SHOPS TO ASSIST WITH TRAINING AND TROUBLE SHOOTING FOR THEIR CLIENTS. 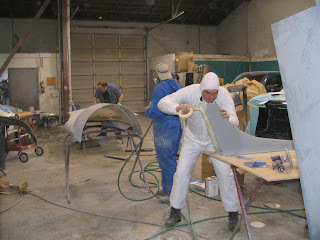 He was very careful with the prepping of the Canopy. Good thing they cost about $10,000. He is one of the representatives for the Eco friendly water borne paint suppliers, BASF. Doug was having a good time teasing Darryl about getting dirty and actually working in a shop! The morning started off with a fury of work getting organised by Frank Vaski Head tech guy for Collision Plus. 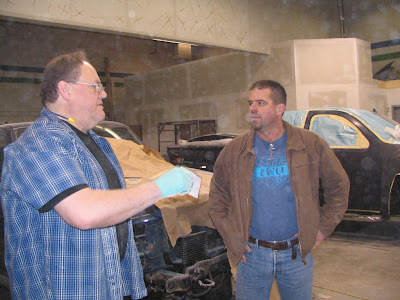 Doug Hannesson, owner of Able Autobody was there to crack the whip (make sure everyone had what they needed)! As you can see here Kevin has color schemed the whole power train frame. Blue at left is incoming cool air, it is heated by the HX40 and flows red to the inlet of the HX53 where it gets a shot of nitrous to cool the charge. 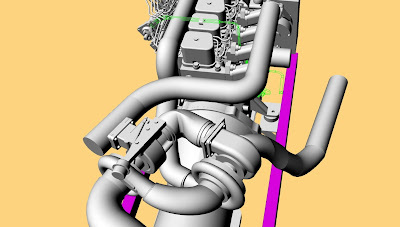 The heated air under 70lbs boost then goes to the intake manifold along with 600-900hp charge cooling oxygen enrichment(NX EXPRESS nitrous) , If the pressure is contained and the pistons don't collapse or melt, then the air (exhaust at 1600f ) emerges from the engine as exhaust gas, pink, to the HX 40 exhaust turbine then to the HX 53 exhaust turbine and then out the pink exhaust pipe. Remember the air is coming in the nose and the car is front wheel driven. Click the image to enlarge!! Kevin Knox (Diversions 3D www.kevinknox.com) has been modelling the twin Cummins HOLESET turbochargers so that the plumbing and brackets are correctly fabricated to utilize the primary #HX40 and the secondary#HX53. 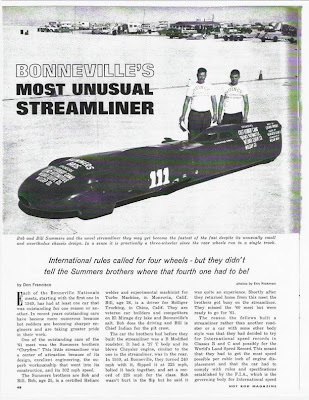 The were engineered by Holest to give us the 1000= hp we will need to go 325mph (520Km) for the Fastest diesel in the Bonneville records. 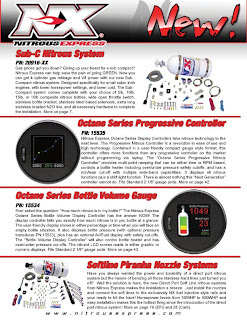 The search went through the whole of the USA and finally we Cummins Parts found just what we required. And as per usual every new part presents new challenges. This meant repositioning the engine forward, left and down into the power train frame to allow the clearance. NO BIG DEAL, Right? Wrong, now we have to make new mounts for the engine and the transmission and the OTT Industries overdrive unit. So Kevin grumbling something about me always building from the outside in, instead of the proper way, inside to out, spent several hours redrawing the new design of mounting system. (DIVERSIONS has hundreds of hours donated to the project and Kevin spends weeks working for bragging rights only! Thank you Muchly.) It is very much better than the previous one as it allows full adjustment so that when we make changes (hope we don't) the mounts can accommodate the change. 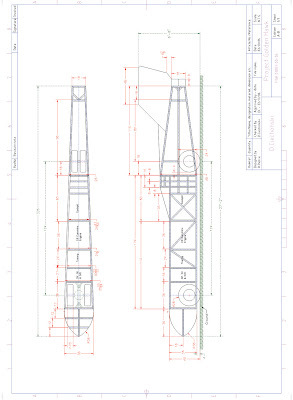 The drawing have been sent to our sponsor Sean Frankforth of Frankforth Water Jet Cutting and are ready for welding at AGGRESSIVE TUBE BENDING and then plating by KOOL Coat. Dan Ciechonski, first Hawk engineer, on the mend! 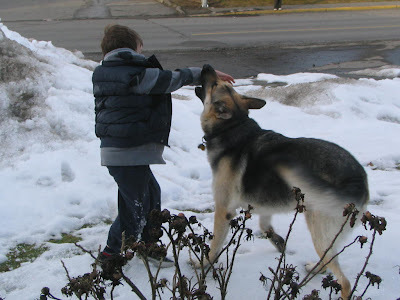 I met Dan and Aries (his big lovable Husky) on a dog walk the first time. We talked of the LSR project then and I met him under the same circumstances but in a different city this week. 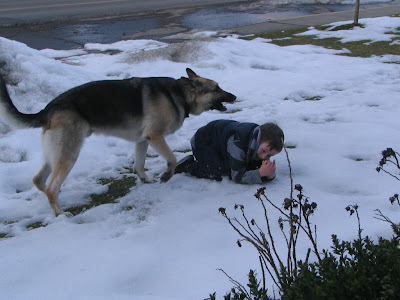 Once again, we talked cars and the Aries and Barklee played and sniffed! Dan Ciechonski, the first engineer to assist with the project at the beginning! He drew the first computer drawings of the Goldenhawk from my crude graph-paper, scaled on the kitchen, table concept drawings. Dan is on the mend, recovering from a crippling Dirt bike crash in May of 2007. He has had surgery to graft nerves on his spine to allow him to regain full use of his left arm. Dan is a fighter and in good spirits, although quite bored during the long wait for the healing which may take up to two years. The team wishes him a speedy recovery and looks forward to him joining us at events leading up to and including Bonneville. 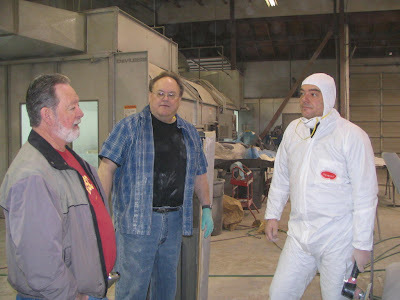 The Last time we saw Zoltan He was just prepping the outline for the body. Annette F. arrived over the holiday season to visit and to see the Hawk. Bring unexpected gifts for the family and Barklee. He loved this ring with a Santa head immediately! Thanks for the surprise gifts , it was great to have you travel from Tucson and endure our winter weather. We will be watching for you to arrive at Bonneville. Special Desert Honey.......... It's really good!